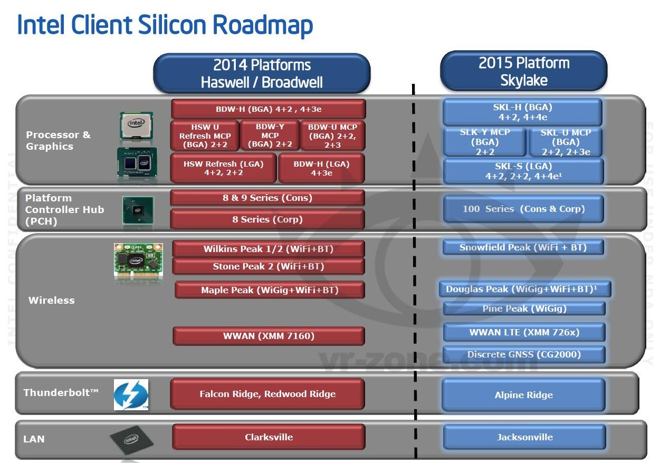 Skylake, the next "tock" in Intel's tick-tock architectural strategy, is designed as a feature expansion of the 14-nanometer architecture the company is moving toward with the oft-delayed Broadwell. Skylake is set to adopt the WiGig standard —a technology that enables gigabit-speed communications without using wires —which will form the basis of the wireless docking capability, according to CNET. At the annual Computex show in Taiwan, Intel demonstrated a proximity-based system that automatically creates a WiGig wireless connection with peripherals, such as keyboards, mice, and monitors, when they are within range of a device. The device returns to standalone mode once it leaves the area. The wireless charging features, meanwhile, were powered by the Rezence standard. Intel is a member of the Alliance for Wireless Power, the organization backing Rezence. Rezence transmits power via magnetic resonance. This provides a number of advantages over traditional inductive charging, not the least of which is that Rezence systems can project power over a much larger distance. Intel demonstrated this capability by charging a laptop through an unmodified table, about two inches away from the charging pad. Apple has shown interest in magnetic resonance charging in the past, notably filing a number of patents surrounding the technology. Apple's implementation would deliver power up to one meter away, which the company calls "a realistic and practical approach" to wireless charging. It is not yet known whether Intel plans to bundle Rezence support into future Skylake chips or leave it as a separate technology. The company generally allows manufactures to mix-and-match platform components like processors and communications chips, and it is possible that they may add wireless charging to the parts bin in the future.